Sansi North America (SNA) Displays’ new Times Square headquarters features a state-of-the-art demo wall, complete with much of the display technology in the company’s product offering. The demo wall includes a digital display array of varying sizes, resolutions, and pixel pitches. For one eye-catching, themed content series, SNA Displays asked Fusion CI Studios to devise a plan to create a sense of cohesion among the screens with unified content theme reflecting the local culture outside and the character of the space inside. Art deco is a strong, vibrant theme in New York City, and it projects a calm, noble strength in the SNA Displays space in the midst of a rather frenetic Times Square location. 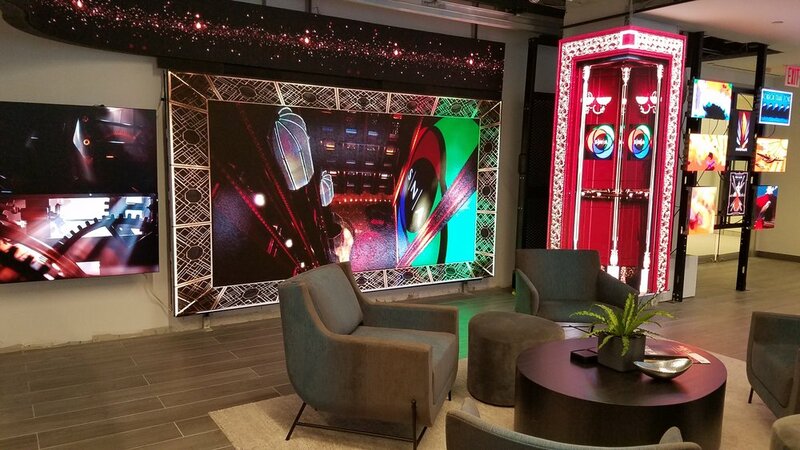 The digital display content, custom-designed by Fusion CI Studios for each screen in the demo space array, involves a state-of-the-art, complex digital process that transforms static imagery into digital fluidity. Designed to target a wide-range of specific colors and hues, the digital fluid tool morphs and shape-shifts and transforms the colors into fluid, allowing one art piece to flow into the next. Art deco posters morph into SNA branding on the main screen, and art evolves into new art on the smaller mosaic displays. The main screen content features a photograph of an NYC art deco lobby, is transformed into an oil painting with visible brush strokes and a digital frame reminiscent of architectural features of the era. The painting magically comes to life as lights illuminate, elevators animate, and the entire lobby mural shape-shifts into SNA’s branding, drawing corporate branding into the cohesive theme. For the vertical column screens, which wrap around the column adjacent to the main display, Fusion CIS designed and modeled a 3-dimensional art deco elevator space to unite with the theme and demonstrate how an architectural column gains spatial dimension when covered with digital displays. Rather than looking at a screen, we’re now looking inside the screen. New ‘real estate’ is born. In this case, Fusion created a working elevator with the SNA logo embossed on brass plates inside that illuminate when the animated elevator doors open. The upper ribbon or ticker display is a lower-resolution screen with a whimsical shape that requires content reflecting its resolution while tying in with the art deco theme. A number of creative options were explored, from strong art deco architecture to softer focus particle effects. The particle effects were chosen. Two LCD displays show customized, augmented film content that portrays the inner workings of the elevator shaft, adding a 3-dimensional perspective to the displays and unifying the elevator sub-theme. Overall, SNA Displays’ art-deco-themed scenes establish a warm, inviting demo space for all visitors of SNA’s Times Square headquarters including clients, vendors and of course employees. The piece reflects the strong, vibrant character of the company and its New York City setting while creating solid brand elements. Combined with the modern look of the rest of the company’s new office space, the demo displays enhance the space as innovative, integrated and imaginative. SNA is hosting an open-house Grand Unveiling event Thursday, Nov. 1 at 5:30 pm. The event, which is part of New York Digital Signage Week, will showcase the newly-renovated 20th floor studio space as well as the demo wall mentioned above. RSVP now if you’re interested in attending.